In our test sys­tem, we were able to ana­ly­ze and under­stand the com­mu­ni­ca­ti­on of some devices that had not worked befo­re. We have adap­ted our sys­tem so that it reco­gni­zes some of the­se models by making the requi­red infor­ma­ti­on avail­ab­le to them. With other models, we still don’t have enough infor­ma­ti­on to gua­ran­tee repro­du­ci­ble and reli­able con­nec­tions. The­re are also models whe­re we don’t even know why they don’t work. We like to get a deeper insights of the DECT infra­st­ruc­tu­re when many dif­fe­rent models from dif­fe­rent ven­dors are regis­te­red. (Perhaps) This will enab­le us to sup­port a grea­ter varie­ty of DECT devices. The basis for this is an under­stan­ding of how dif­fe­rent devices com­mu­ni­ca­te on the DECT inter­face. The­re­fo­re, we need signi­fi­cant­ly more sam­ple data than what we can pro­du­ce by manu­al tests. Sin­ce we do not store any con­nec­tion data, we are not able to ana­ly­ze data from past events. Becau­se of this, we want to store con­nec­tion data on the Eas­ter­hegg 2019. Cur­r­ent­ly we have not found a way to offer opt-in on a per user basis. We could not ans­wer many ques­ti­ons such as: “What do we do if a par­ti­ci­pant agrees to cap­tu­re the data and calls a par­ti­ci­pant who has not agreed?”; “What hap­pens with a group call whe­re some mem­bers have agreed and some have not?”. If we optio­nal­ly anony­mi­ze data per user, you can still see who tried to call from the call set­up and you have to dele­te the attemp­ted call set­up for the user who tried to call and vice ver­sa. Sin­ce we know that it is basi­cal­ly bad to store data, we have come to the con­clu­si­on that the situa­ti­on doesn’t get any bet­ter if we make users belie­ve that it’s safe to click on a check­box when we can’t make sure it will work. We have deci­ded to make trans­pa­rent what we intend to do with the data, store it in a respon­si­ble way and to dele­te it safe­ly after a spe­ci­fied peri­od of time. If you do not want your meta­da­ta to be stored, you must not use any of our exten­si­ons on Eas­ter­hegg 2019. We belie­ve that, unli­ke a Con­gress or Camp, this is accep­ta­ble on an Eas­ter­hegg. It is basi­cal­ly about the meta­da­ta of the DECT exten­si­ons. Speech/Voice data is not stored. The con­trol messa­ges bet­ween the anten­nas and the cen­tral soft­ware com­po­nent that coor­di­na­tes the anten­nae and pho­nes are affec­ted. the acces­ses to the pho­ne book (for some devices). Examp­le: We store when Ali­ce cal­led Bob, how often it rang, how long the call las­ted, what device Ali­ce used, which device Bob used, what was shown on the dis­plays and that during the call e.g. key 2 was pres­sed. This inclu­des all data necessa­ry to set up and dis­con­nect the call as well as the base sta­ti­ons invol­ved. We do not eva­lua­te keystrokes and acces­ses to the pho­ne book, but we can­not rule out that this infor­ma­ti­on will be sent. Where is the data stored and how? For the Eas­ter­hegg, we will take the ser­ver to a secu­re data cen­ter. The collec­ted meta­da­ta is stored encryp­ted. Access to the data is exclu­si­ve­ly encryp­ted. The data is expli­citly exclu­ded from all back­ups. The meta­da­ta of Eas­ter­hegg 2019 will be stored for a maxi­mum of 4 mon­ths, i.e. until 23.08.2019 (end of CCCamp 2019). By 25.08.2019 at the latest, the data will be dele­ted and the area over­writ­ten. We will offi­ci­al­ly announ­ce the dele­ti­on. Can I make a phone call without saving the metadata? Yes, if you use a SIP exten­si­on and call ano­t­her SIP exten­si­on, no meta­da­ta will be stored. Howe­ver, you can­not ensu­re that a user has not con­ver­ted a SIP exten­si­on into a DECT exten­si­on or group at short noti­ce. So you have to check if the exten­si­on you want to call is a SIP exten­si­on at the moment. Can I use the services of the PoC anonymously? Yes, you can regis­ter with fan­ta­sy names and anony­mous e-mail addres­ses. We will then have the meta­da­ta, but we won’t be able to assign it to a real per­son. Note, howe­ver, that you are not using the pho­ne at the camp (or 35C3) with a real name, becau­se then we would be able to mer­ge the data using the IPEI (we don’t intend to). Do I have a right to information? Tho­mas ist Event­pho­ne Full­stack Ent­wick­ler und gehört seit Jah­ren zum Team. Er lie­fert aber nicht nur Code und admi­nis­triert das Blech, son­dern ist auch im Kun­den­sup­port, der Logis­tik, im Back­of­fice sowie im Mar­ke­ting und der “Unter­neh­mens­kom­mu­ni­ka­ti­on” aktiv. Next PostNext Achtung! 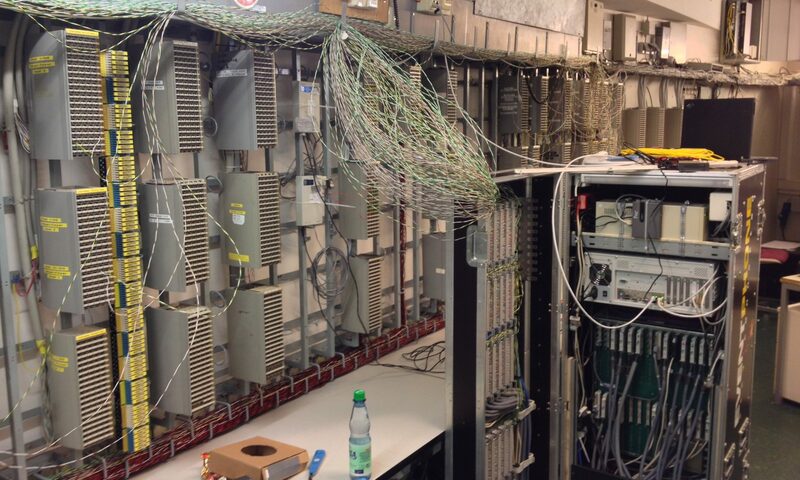 Wir speichern auf dem Easterhegg 2019 die Metadaten der Telefonie-Endgeräte.